Everyone commented that they had never been to a wedding that the dance floor was continuously jumping, even during dinner (which is what the bride wanted) People loved that the DJ was out on the dance floor participating and getting the crowd involved. He was very courteous, Polite and had a continuous smiling face and fuel of energy. DJ Izzy is unlike any other we've had. The music was so incredible that our party turned into a remake of Mick Jagger's "Dancing in the street" video . For future parties, we can't think of anyone we would rather have as our DJ. 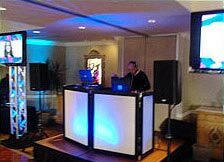 Thank you Izzy, for making our party such a memorable one.Izzy, Just a note to say a big thanks for getting me "Eddie" as my DJ for the Feb 25th Party, we loved him, he was great !, and yes you can recommend him. The people had a blast, especially when he did the trivia!! !, please send me his e-mail so that I may thank him also!. Gracias, For two years running my husbands employer ( KB Electronics in Coral Springs, Fl.) has trusted you With the entertainment portion of their Annual Company party and with good reason. The company employees encompasses a wide variety of cultures and ages, and the incredible music collection and your wisdom to " put it all together" if you will, makes an otherwise boring bland event into an absolute blast ! If you look closely (as I was) Everyone- All ages and cultures got to enjoy themselves. They have only you to thank for that Mr. Del Campo.Excellent Service, Terrific DJ Personality, Wonderful all around. 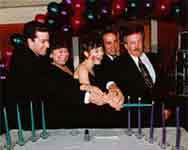 "My family and friends had so much fun - we would have danced ALL NIGHT!! Thank you for making our family feel so special!!" Want to impress friends with the newest technology at your next event, Green screen technology has opened the door to some pretty amazing and extremely funny games and activities. Bopping heads is one of the funest of these inventions, it started with Green screen Photography and now Green screen video is now available. 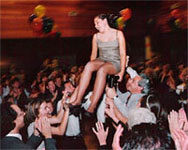 Green screen video technology, Mitzvah fun, Corporate fun, carnival fun, entertainment for fairs, Americas funiest videos, Innovative Mitzvah Games, Corporate entertainment, Green screen photography, Green screen, video technology, and special events, in Ft.Lauderdale, Florida, Miami, Boca, Boca Raton, Broward County, and anywhere in South Florida. Want to make your Mitzvah, Corporate event, Wedding, School fair, or any other event totaly unique, want to impress your friends with the latest technology, then Bopping heads it just what you need. Below are some videos of Bopping heads in action at some previous events. Please call us today to reserve Bopping heads for your special event.